If you’ve ever had needle phobia, you might like to learn about a new technology referred to as an “anesthesia wand,” which is a computer-controlled dental-injection tool. In fact, some people feel it is more of a “magic” wand because it doesn’t look like a typical injection and it works even better by making the entire process virtually painless. Once the needle is in place, the computer delivers an accurate, consistent amount of anesthesia so that you remain comfortable — typically below the threshold of pain. The computer’s microprocessor automatically adjusts the injection pressure for different tissue densities, maintaining a constant, comfortable flow of anesthesia. This is important because the culprit with most injection anxiety is discomfort from anesthetic being injected too quickly, not from the needle entering the skin. One of the most important advantages is that it doesn’t look threatening, as it eliminates the initial anxiety upon seeing a syringe. 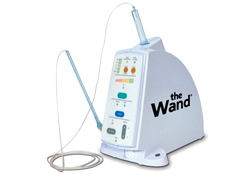 Due to the wand’s penlike grasp, it is easier to handle, rotate, and accurately glide the wand into precise, hard-to-reach places to deliver anesthetics.